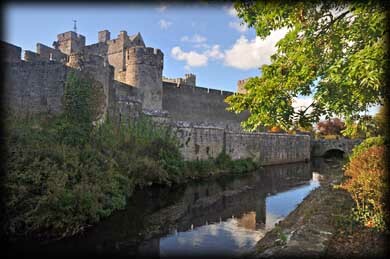 The origins of Cahir castle can be traced back to an earthen fort (or Dun) built on a rocky island in the River Suir which gave the town its original name "Cathair Dun lascaigh" or "town of the fishing fort". 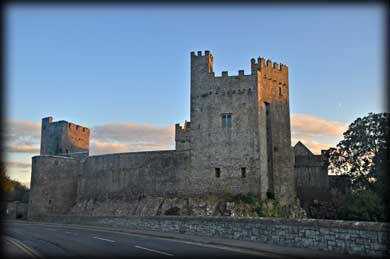 Conor O'Brien, Prince of Thomond, fortified the site in 1142, just prior to the Norman invasion of 1169. 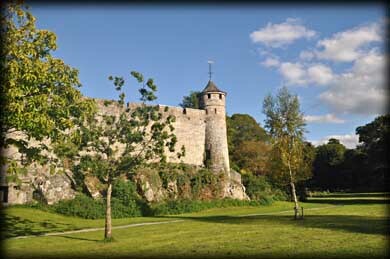 The oldest part of the castle, the Keep, is Norman and was constructed in the 13th century. It is part of the Inner Ward in which most structures now stand. In 1375 the castle was granted to James Butler, newly-created Earl of Ormond, for his loyalty to Edward III, and was enlarged to include a middle ward and an outer ward in the 15th century to befit the stronghold of the powerful Butler family. The photos clearly show that the curtain wall closely follows the edge of the rock. It is fortified by at least two rectangular towers and one rounded tower in the corners of the inner ward. The castle had been built to be impregnable, with layers of defenses that were successful until the advent of heavy cannons. 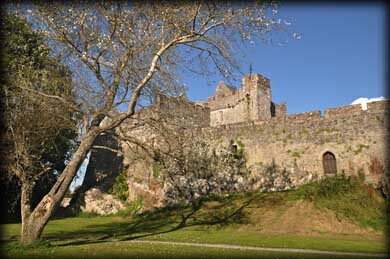 The castle was captured by the Earl of Essex in 1599 after a three day bombardment which caused considerable damage, and a cannon ball is still lodged in the wall of the northeast tower. The castle was once again besieged during the Irish Confederate Wars but was surrendered to Cromwell in 1650 without a battle. It fell into ruin in the late 18th century. It was partially restored in the 1840's, including partial rebuilding of the Great Hall and the building of Cahir Cottage at the far end of the outer ward. It wasn't until 1961 when the last heir to the castle died that the castle reverted to the OPW and became a National Monument. Restoration at that time included careful reproduction of the portcullis. Although the castle is open all year round, it closes earlier in the winter period and was closed by the time of our visit. We are looking forward to returning to one of Ireland's largest and most beautifully preserved castles to tour the interior. Situated: Very easy, located in the centre of Cahir on the R640. (Castle Street). Discovery Map 66: S 0497 2478. Last visit Sept 2012.